"People lose their homes and have to move to apartments that don't accept pets"
MIAMI, Florida (CNN) -- Furry signs of a down-trending economy peer dolefully from every kennel at the Broward County Humane Society shelter in Florida and hundreds of others across the country. Bentley was given up by his owners because they could no longer afford him, a Florida shelter says. 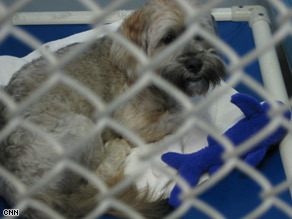 Bentley, a 3-year-old Lhasa apso, was given up by his owners because they just couldn't afford to keep him any more. Tinkerbell, a sweet, docile house cat, was surrendered by her owners after they found out that they had lost their home. With foreclosures disrupting life, from the family house down to the dog house, and as Americans toil through a tough economic landscape, some of their pets face an even bleaker future in the pound. "People lose their homes and have to move to apartments that don't accept pets, so they give them up," says Cheryl McAuliffe, a spokeswoman for the Georgia State Humane Society. Over the past eight months, shelters around the county have seen more animals turned in because their owners have lost their homes or jobs. The shelters are also straining to meet a sharp increase in requests from people who are struggling just to provide food for their pets, says Stephanie Shain, director of outreach for the Humane Society of the United States. Although they no longer have loving homes, Tinkerbell and Bentley are lucky because their owners gave them up to the shelter. Not every pet gets that kind of treatment. Miami-Dade Animal Services says that on a regular basis, it is called to foreclosed properties where neighbors report seeing pets chained up in a backyard or locked inside an empty house. "I understand they may be scared for themselves and their kids when they have to leave, but I just wish people would find a place for their pets, too," says Sherry Marks, a Miami-Dade County animal control specialist. Marks and other county animal control specialists get calls from police when they find a foreclosed home with a pet left behind. And it's not always easy to deal with the abandoned pet, she says. Some dogs are frightened and run, and others become aggressive. Responding to a call in North Miami, Marks found two dogs at a home abandoned by foreclosure. With their leashes and water bowls still in the backyard, the dogs lingered. They didn't know and couldn't understand why it wasn't their home anymore. A spokesman for the Humane Society of Douglas County in Georgia said the abandonment rate is tenfold what it was two years ago, before waves of foreclosures started hitting neighborhoods around the county. With more animals coming in and fewer people with the resources to pay for a pet, nearly all shelters there are overrun. The rapidly approaching holiday season is usually a very busy adoption time for shelters. Last year, the Broward County Humane Society sent 60 animals to new homes December 23. This year, they say, they'll be thrilled if they adopt out anywhere near that number. But Humane Society officials say people can economize when getting a pet. They urge people to adopt instead of buying a cat or dog. Adopted pets cost less than animals from a pet store, and they will already be spayed or neutered and have their initial set of vaccinations. Also, pet owners don't have to choose between taking care of their pets or taking care of themselves. Most local shelters offer vaccinations, spaying or neutering at a fraction of the cost of a private veterinarian's office.